This cozy kale, white bean and butternut squash soup provides the ultimate in soul-satisfying, tastebud pleasing, nourishing goodness. Three highly nutritious foods come together in this tasty one pot vegetarian meal in a bowl, lending it vibrant color and flavor. For a fitting accompaniment, try toasted baguette or crostini spread with goat cheese. I love soup. 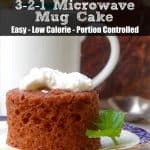 It’s my magical weight loss secret! Eating a bowl of soup for lunch and/or dinner several times a week is one of my favorite easy, healthy delicious strategies for staying at goal or losing any extra pounds that can creep up on me. 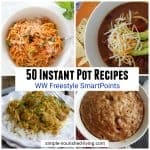 It’s weight management magic in a bowl! 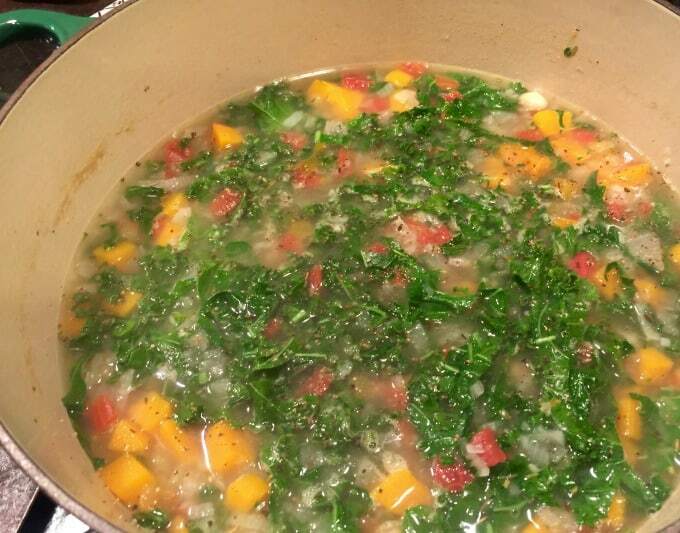 Soup fills you up with fewer calories. 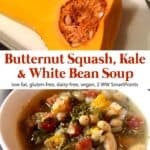 What are the Calories/WW SmartPoints for this Kale, Butternut Squash White Bean Soup? 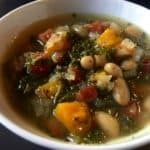 The most challenging part of this easy, healthy Kale, Butternut Squash and White Bean Soup Recipe is Preparing the Vegetables…. 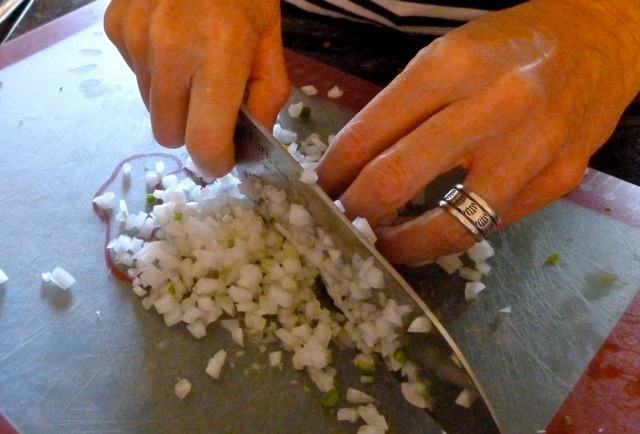 Peeling and finely chopping or dicing the onions. 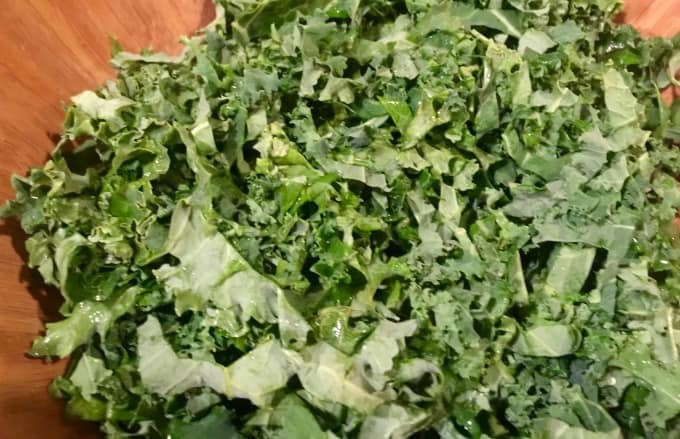 Removing the stems from the kale and slicing it thin. And peeling/chopping the butternut squash. Of course this can be mostly avoided by choosing already chopped vegetables that are so readily available in so many grocery stores these days! 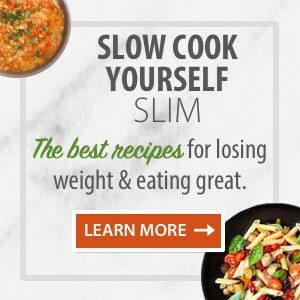 The smooth skin and somewhat elongated shape of a butternut squash make it one of the easiest squashes to work with, provided you have the right tools: a really sharp Chef’s knife (affiliate link), cutting board (affiliate link) and vegetable peeler (affiliate link). 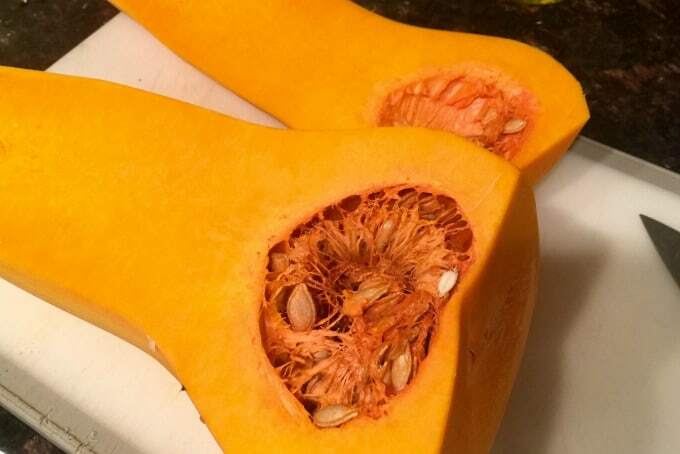 All you need to do is place your squash on its side and slice off both ends. Lots of folk claim it’s even easier if you microwave the entire squash for a minute or two, but I’ve never felt it was necessary. Next I like to peel my squash. 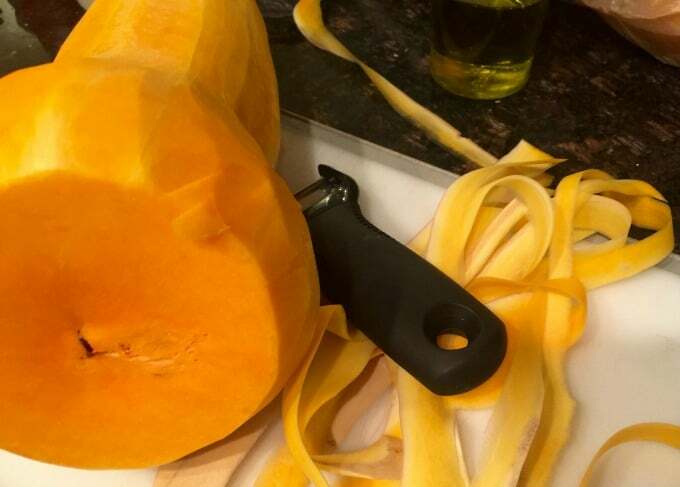 Place the squash on its side and run your peeler along its length. You can peel the length of the squash in long strokes or you can peel it half way up the sides and then turn it and peel the other half. Totally your choice. Cut the squash in half. 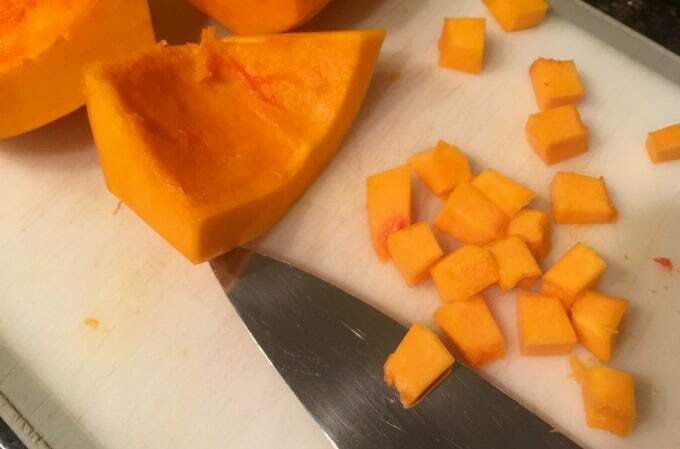 You can also cut the squash at the neck first and then cut the two pieces in half if you prefer. Using a spoon, scrape out the seeds and any stringy bits. Be sure to save the seeds if you have ambitions to roast them. Slice each half into strips and each strip into cubes. In a large soup pot or Dutch oven set over medium heat, heat the oil. 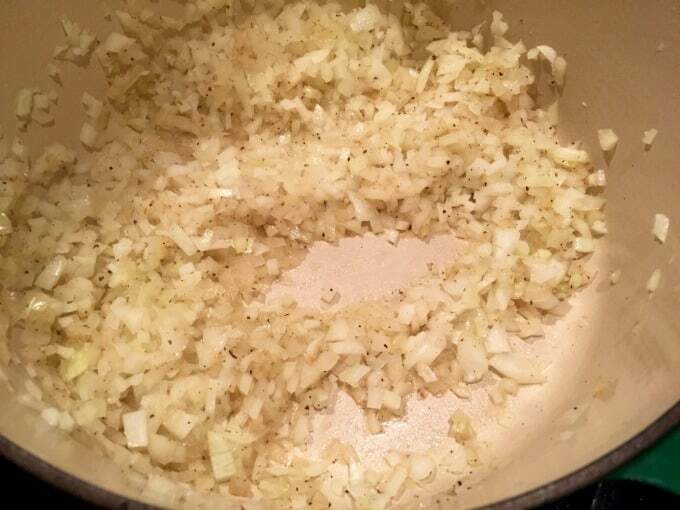 Add the onions, and cook, stirring often until tender, about 10 minutes. Stir in the vegetable broth (affiliate link), tomatoes, rosemary, salt and pepper. Bring to a boil and add the squash. Lower the heat to a gentle simmer. Cook until the squash is tender, about 30 minutes. Add the beans and kale and cook for 15 more minutes. Toasted baguette or crostini spread with goat cheese. 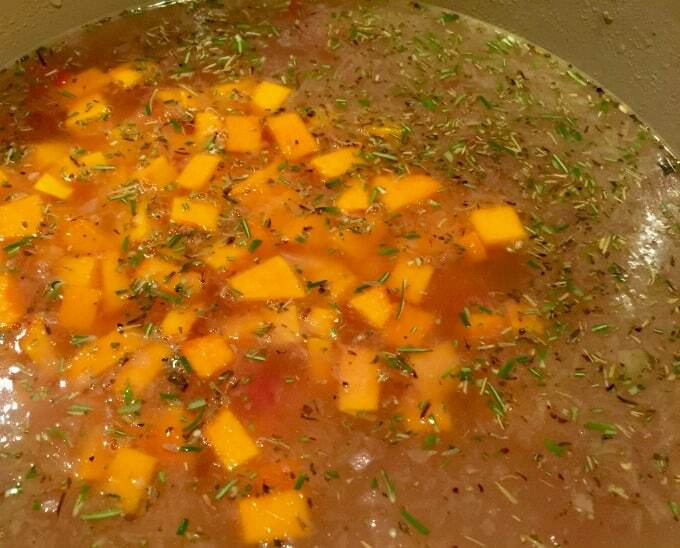 Stir in the vegetable broth, tomatoes, rosemary, salt and pepper. Bring to a boil and add the squash. Lower the heat to a gentle simmer. Cook until the squash is tender, about 30 minutes. 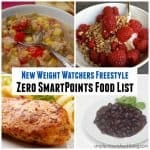 Need a little help getting back on track? Eat soup. 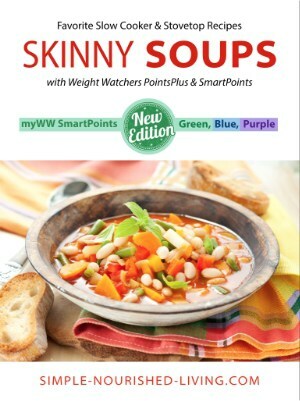 My Skinny Soups eCookBook brimming with easy, healthy, delicious recipes for the slow cooker and stovetop will help! I agree with you about all the healthy benefits of soup, when it’s WW-friendly. 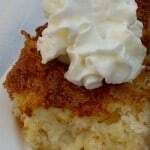 Thank you for sharing a vegetarian recipe! 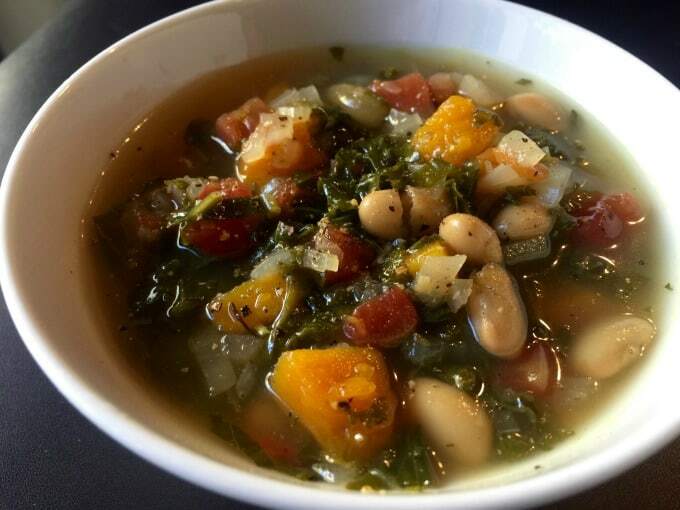 Your Butternut Squash Kale White Bean Soup looks awsome! 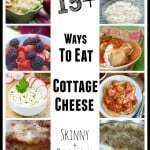 Only 113 calories? Wow. This is something for me. Definitely will try this out. 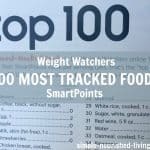 I’m currently thinking about losing weight. Could you give me an advice, which program should I use? or where to start?